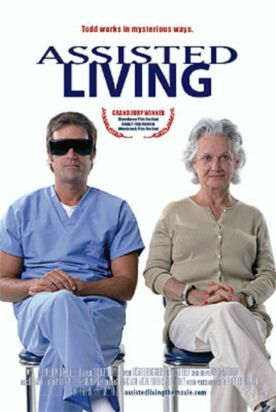 Elliot Greenebaum’s first film, Assisted Living, is set in a nursing home like Rory O’Shea Was Here, which came out in the same week. I fear that it may suffer from the comparison. But if not quite so good a film it is nevertheless well worth-seeing. It took me a little while to get used to the curious set-up, since the movie is an interesting combination of drama and documentary. The nursing home is a real one, in Kentucky, and there are enough shots of its actual elderly residents going about their sad daily tasks — bingo, TV, happy talk religion, old-folks exercises — to give us a sense of bleak authenticity. And just off-stage we also catch glimpses of the "secure unit" where the residents are past even bingo. That this should be the last of life’s pleasures to be taken away from us seems in itself reason enough to wish never to make it to the point of living among the completely mentally or physically incapacitated who are waiting to die. In a way this kind of thing is very easily done and the ga-ga grannies as facilely to be pitied as poor old Rory O’Shea in his electric wheelchair. It’s shooting emotional fish in a barrel. But, like Damien O’Donnell in Rory, Greenebaum goes to some trouble to take away from us this simple and obvious response. For one thing, he almost completely seals up the nursing home’s entrances and exits. No one from outside ever comes in; no one from inside ever goes out. In fact, we never so much as see that there is a world beyond the grounds of the home except on the TV in the common room and in one brief scene where an orderly called Todd (Michael Bonsignore) is seen getting up after a night of dissipation and debauch and hurrying to get to work there in a vain attempt to avoid being late for the third time this week. As a result the institution has a self-contained quality that makes it seem a world unto itself, and one where our pity is curiously obtrusive and out of place. More importantly, against the background of human decay and dissolution, Greenebaum presents what in any other circumstances might be the rollickingly funny fictional (or quasi-fictional?) account of poor old Todd’s dismissal from his job at the home, whose fictional name is Meadow View. An obvious slacker, he is not only a habitual late-comer, but he also sneaks off several times a day to smoke marijuana and amuses himself by playing pranks on the residents. In one hilarious scene he pretends in a series of telephone calls to be a relative calling from heaven to tell them what it’s like there, and how lovely everything is — until he makes the mistake of telling one old woman that her mother is there. "But Mom’s not dead yet," she says. Presumably she’s upstairs in the secure unit. Making a quick if ridiculous recovery, Todd says: "You don’t have to be dead to get in. There’s all kinds of people here who aren’t dead yet —" and then, over-reaching a bit: "You’re here." "Put me on," says the old lady. Todd, adopting a slight falsetto, brazens it out — "Hello? Is this me?" — and we cut to the woman looking baffled and incredulous. "Sorry," he adds. "This must be real hard on your head." Todd is clearly very thoughtless, but his intentions seem kindly and expressive of a tender heart. And phone calls from a comically bogus hereafter remind us in another and less pathos-laden way of the God-forsaken loneliness of those who never get calls from anybody else. One in particular of Meadow View’s residents, Mrs Pearlman (Maggie Riley), is in the early stages of Alzheimer’s disease and keeps asking Todd to have someone check to see if her phone is working. It must be out of order, or else why doesn’t her son, who she says is living in Australia, call her? Ultimately, Todd is driven to call her himself and pretend to be the Australian son — which prompts her to go into a state of emotional "meltdown." This seems to be the final straw for the home’s director, Hance Purcell (Clint Vaught), and the documentary feel of the film is heightened by mock interviews with him about why Todd has had to be fired. These interviews are in the movie’s present tense, as it were, so that Todd’s escapades, though they make up most of the film, are pushed into what amounts to flashback. Meanwhile Purcell, for whom Bourbon serves the same function that marijuana does for Todd, never quite gets to the point of explaining what happened to Todd as he is constantly interrupted by efforts to resolve a half-comic, half-serious domestic crisis over the telephone. He too is reduced to a merely telephonic connection with what, if anything, exists outside Meadow View. That makes it seem a good deal less bizarre when Todd decides to allow Mrs Pearlman to go on thinking that he is her son and that they are both in Australia. They might as well be for all we can tell. Though as irresponsible and undisciplined as Rory O’Shea, Todd is less sympathetic, but his relationship with Mrs Pearlman is, so far as it goes, a little gem of film-making that promises even better things for the future.